Don't be fooled by light weight imitations. These are the Original Roll-or-Kari Dual Dollies. The sturdiest Heavy-Duty trucks in the industry. Made right here in the USA of the strongest materials. 3-1/2” wheel made of thermo plastic rubber, non marking. Move Pianos & Organs, Appliances, Computer Frames, Furniture, Select Vending Machines, Cabinets, or any heavy load. Sold as a set (2 pieces) These are simple to operate. Place one truck at each end of the instrument or load, fasten the straps and press the foot lever at each end to raise it for moving. Handles fold out of the way when not in use. Rubber and felt cushioning will give you complete protection at vital spots against marring of the finish on the item you're moving..
Adjustable straps lock around the instrument securely. 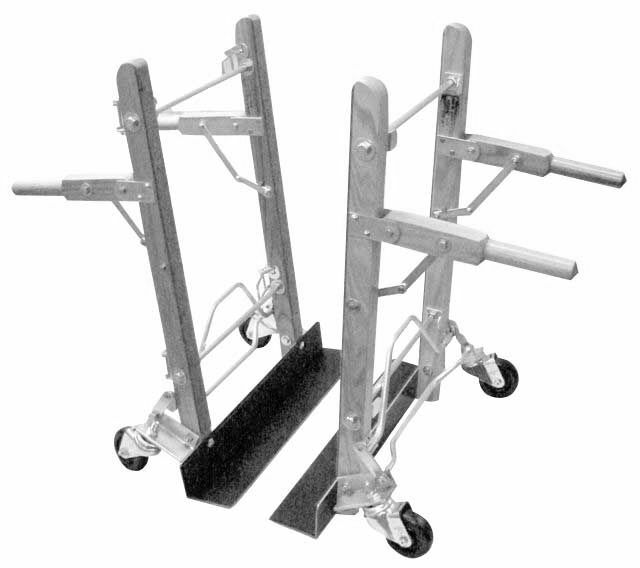 Retractable wheels allow instrument to rest on its own weight while in transport, to avoid skidding or rolling. These features are unique with swivel wheels at both ends. Includes four 7' web straps included. (Larger straps can be bought separately). 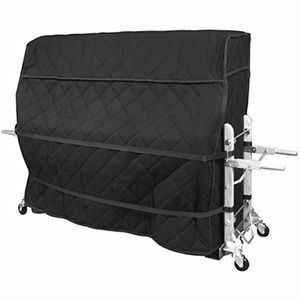 Heavy duty padded cover assures protection when moving the instrument. This is not a commercial padding material but is made exclusively to our specifications. Outside of things that were beyond everyones control my experience has been very good. The people i dealt with were helpful knowledgable and very pleasant to deal with. Anymore piano related items you have all my business as well as anyone i know. Thank you the items arrived in good shape and should give me years of service. The piano dollies were a delight to use. All who helped with loading and unloading the piano were pleased with how well the dollies worked and how easy they made it. The mechanical design for lowering and raising the wheels, the height of the handles, locking of the straps, etc., worked beautifully. I ordered the product over the phone and the sales person was helpful and knowledgeable about the product. It arrived as promised with no problems. The quality is good and I expect that it should last some time. We had a great experience with this company. The price was good. There was no delay in shipment, we received the item in just a few days and it was exactly what we were looking for. Very well pleased! Thank you for your prompt delivery of our Dollies. They arrived in excellent condition. We have already put them to good use moving a large 3 manual pipe organ console their first week in the shop.